The basics of the FX21-N Revolver match those of the higher quality Trev-7 Revolver which SOG no longer manufactures. The blade quality of the lesser 440A steel is still serviceable but will require more maintenance than the tougher and harder AUS-8 of the Trev-7. Although it's made in Taiwan for SOG, the FX21-N has earned a reputation as a reliable camp and survival tool. The Revolver overcomes some of the structural weaknesses of the folding knife with its unusual revolving blade. One blade always remains in open position, locked in place by a pressure pin in the base of the handle. This locking system gives the knife nearly as much blade security as a fixed blade. Thumb pressure on the pin lever releases the blade, allowing the user to reverse it on the bearing, placing the second working edge in open and locked position. The knife functions well as both a 4.7-inch combo-edged Bowie clip point knife and a serrated double-tooth saw. 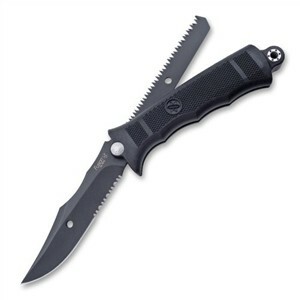 Weight of the 10-inch knife is a surprisingly light 6 ounces due to the glass-reinforced nylon handle grip. The structure under that grip is reliable stainless steel. You'll need a good belt sheath for the Revolver since it handles and stores like a fixed blade. The light nylon sheath supplied with this SOG Revolver fares better if the saw blade is stored in the handle and the knife side of the blade is locked open, since teeth easily snag the fabric of the sheath.